Mounted on a choice of MEMLO cast iron tranformers. We recently salvaged a run of MEMLITES from a small local engineering works, with the added benefit of their original MEMLO transformers. 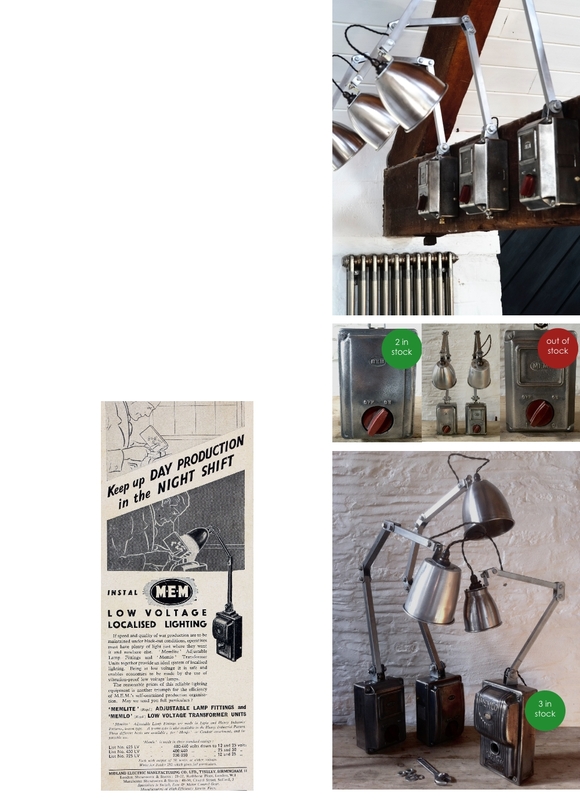 The transformers, like the lamps vary in style from rounded deco lines with tactile black bakelite pull switch to the robust, utilitarian chunky red 'on/off' switch on the two later models. The accompanying lamps have identical arm sections but come with a choice of goblet, flowerpot or small trumpet shaped shades.We have removed the tranformer 'innards' and wired them as 'on/off' switches. The weight of the tranformers allow them to be used as desk lamps or they can be wall mounted as originally intended. £350 each deco style with pull switch.